One Piece Dress and Jacket. Slim dress buttons below the back V neckline to the hem. Shaped front neckline with turned down revers attached to the back. Contour hip belt. 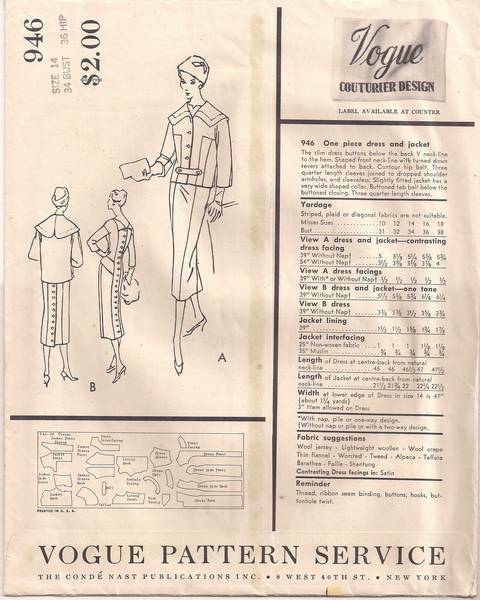 Three quarter length sleeves joined to dropped shoulder armholes, and sleeveless. Slightly fitted jacket has a very wide shaped collar. Buttoned tab belt below the buttoned closing. Three quarter length sleeves. Size 14; Bust 34: Waist 26; Hip 36. Pattern is unused, complete and in it's original factory folds. Contents are in excellent condition. The tan tissue pattern pieces are wrapped in pale blue protector tissue. The linen finish envelope has fared well thru the years - it is sturdy and complete with light to average age toning. Two very small spots on the envelope front - center, 1" from bottom. 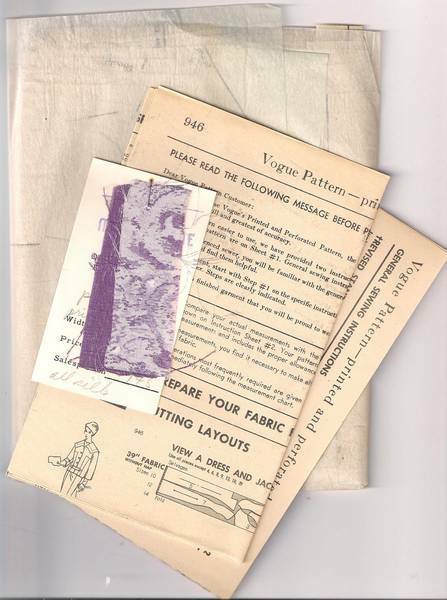 A fabric swatch card from Miller and Paine found in the envelope is also included.